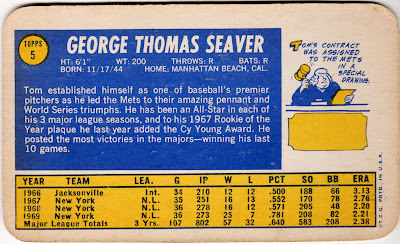 Today's photo catches Seaver right off 1969's Amazing Mets championship season and his own NL Cy Young award. Tom Terrific went on to average nearly 18 wins a year for the next decade in New York and Cincinnati, a phenomenal run rivaled by few of his contemporaries (just Steve Carlton and Nolan Ryan come to mind). 99% of HOF voters put him on their ballot in 1992, a great measure of the respect he earned over 20 seasons (career stats at B-R.com). 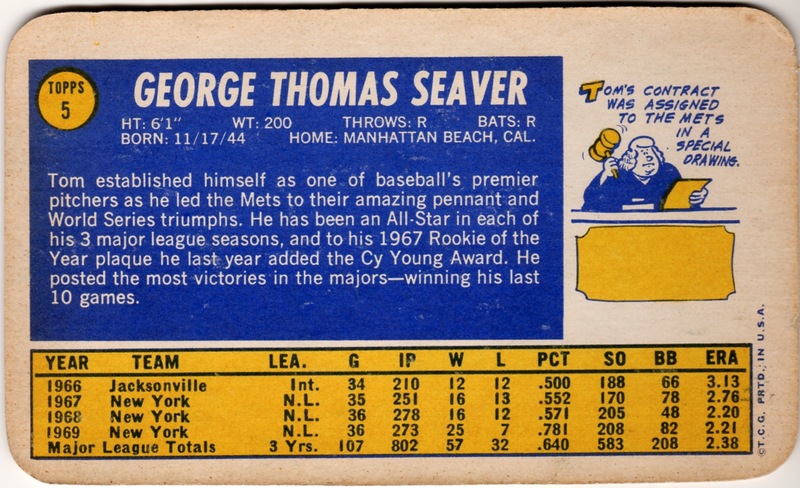 1970 Topps adopted this yellow-and-blue design for both regular and Super sets; Seaver's includes a cartoon about his early contract snafu with the Atlanta Braves, which Wikipedia expands on. 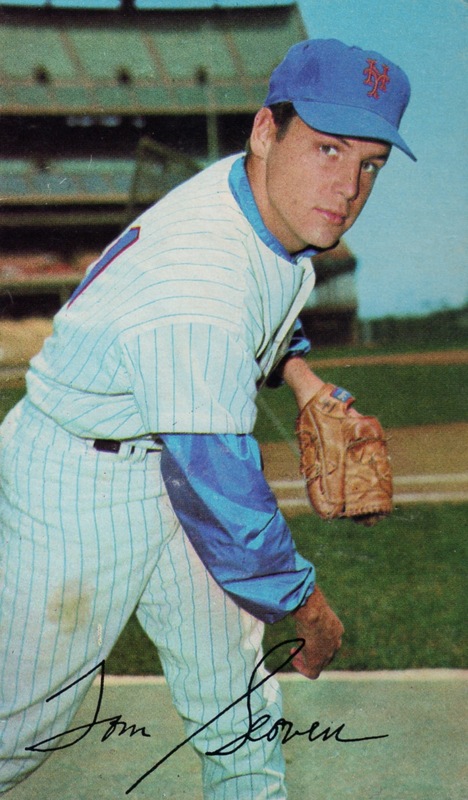 "In 1966, [Seaver] signed a contract with the Atlanta Braves, who had drafted him in the first round of the secondary June draft (20th overall). However, the contract was voided because his college team played two exhibition games (although Seaver hadn't played). Seaver intended, then, to finish the college season, but the NCAA ruled him ineligible. After Seaver's father complained to Eckert about the unfairness of the situation, and threatened a lawsuit, Eckert ruled that other teams could match the Braves' offer. The Mets were subsequently awarded his signing rights in a lottery drawing among the three teams (the Philadelphia Phillies and Cleveland Indians being the two others) willing to match the Braves' terms." Hard to imagine Seaver in a Braves hat, but it could've (should've?) happened! Value: Topps short-printed eight 1970 Supers, including this number five, pushing those prices up a bit. I found mine on eBay for $5 several years ago, but they're likely higher now. Non-star cards cost a dollar or two. Fakes / reprints: Some of Topps' best vintage photography appears on Supers. It's likely they re-used some star player photos for modern sets, but I haven't seen any direct reprints. Very nice card. I gotta find me one of those. Good luck! Willie Mays is my favorite from that year.